January 10, 2018 – San Mateo, CA – Kyndi™, the leading Explainable artificial intelligence company that was recently named to the AI 100 for 2018, today announced that it has hired Amandeep Dhillon, a 25-year veteran technology and sales executive in the Federal Government sector, to head the company’s US Government business. As Vice President of Kyndi Federal, Dhillon leads Kyndi’s newly established unit whose mission is to enable US Government entities to transform their knowledge and business processes by offering explainable, auditable AI systems. Founded in 2014, Kyndi is building the first Explainable AI™ platform for government, financial services, and healthcare. Kyndi’s novel approach to AI unifies probabilistic and logical methods, allowing organizations to analyze massive amounts of data to create actionable knowledge significantly faster and without having to sacrifice explainability. Kyndi ’s Explainable AI™ Platform supports critical solutions for Intelligence, Defense, Compliance, and Research. Before joining Kyndi, Dhillon was Vice President of Federal Government Solutions at Code42, a security solutions company. Before that, he held senior sales and marketing positions at technology companies and Federal systems integrators that serve the US government, with a focus on Defense and Intelligence. Dhillon holds a Bachelor’s of Science Degree in Electrical and Computer Engineering from George Mason University, and a Master’s Degree in Technical Management from The Johns Hopkins University. Kyndi is an artificial intelligence company that’s building the first Explainable AI™ platform for government, financial services, and healthcare. We transform business processes by offering auditable AI systems. Our product exists because critical organizations cannot use “black box” machine learning when they are required to explain the reason for any decision. 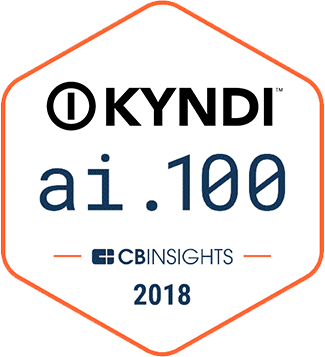 Kyndi recently was named to the prestigious AI 100 for 2018. Sponsored by CB Insights, the AI 100 includes the most promising 100 private companies working on groundbreaking artificial intelligence technology. Based in Silicon Valley, Kyndi is backed by leading venture investors. For more information, visit www.kyndi.com.